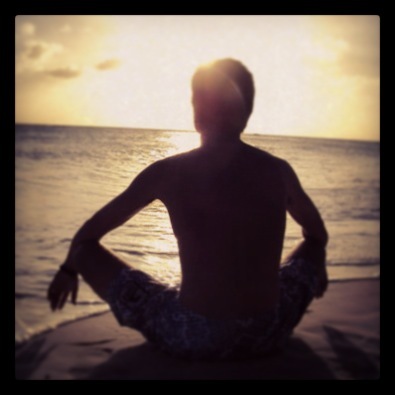 For me, the daily decision to sit down and meditate is about more than just becoming enlightened. It is also about developing a muscle. Similar to going to the gym, when I do abdominal repetitions my abdominal muscles strengthen; that’s all. When I meditate— when I put my attention on my breathing, letting my thoughts pass one by one— what I am doing is strengthening my attention muscle; that’s all. Certainly, there have been moments in which I have had experiences beyond my physical body and experienced how I am a part of and close to that which some call Spirit; but beyond these experiences, meditation has also allowed me to respond better in complex situations than if I hadn’t trained my “coming home” muscle. 1. Meditation is as important and as insignificant as any other practice we might have – exercising, playing an instrument, cooking— because a practice is already a form of meditation. 2. Meditation is a space that makes me feel home. That small altar that over the years has been nurtured with sentimental valued objects; that cushion and that blanket I cover with, especially on those cold days; make it so my house is one where I can be alone and feel at home. 3. Meditation helps me go back to my center. Over time, continuously practicing going within; even though I still sometimes fall asleep, have my legs go numb, or have sessions where my thinking won’t slow down; being aware of my breathing and counting “one, two, three, four…” has helped me to not react and to detach from my thoughts and emotions enough to be present in myself. To sit and count one to ten with each breath, going back to your center every time a thought arises, is a simple but rigorous method that I have practiced with good results. [i] Results were published in Psychiatry Research: Neuroimaging (Jan. 30, 2011).